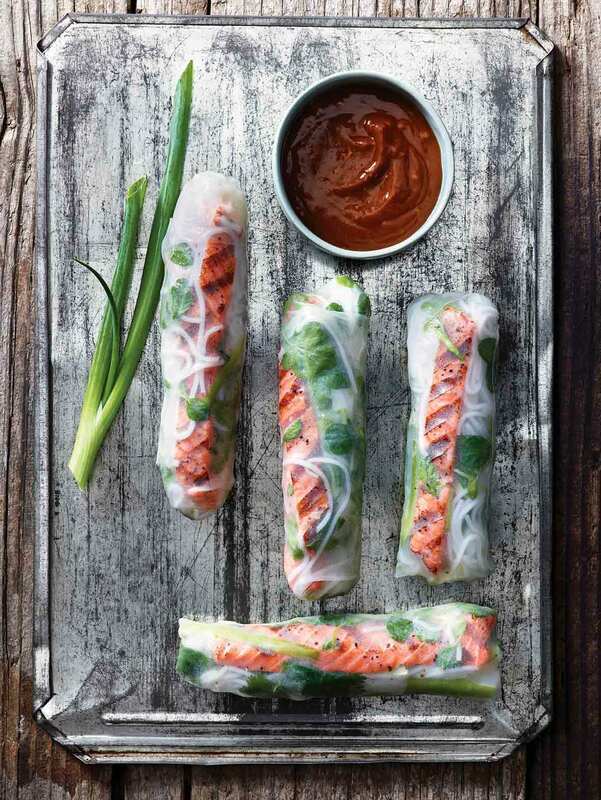 Salmon summer rolls are a simple and stunning upgrade to classic Vietnamese summer rolls with shrimp and pork. So go on, swap out some more ingredients to create completely personalized noshes. 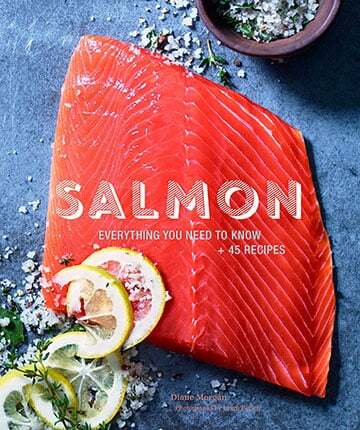 Author Diane Morgan has already upended traditional Vietnamese summer rolls by using salmon in place of pork and shrimp. But why stop there? “What goes into the salad roll depends on what you like and what you have on hand,” she explains. “Sometimes I use watercress instead of pea shoots, add shredded carrots, and use mint instead of cilantro.” Let us know in a comment below how you end up making these summer rolls your own. 2. Bring a small saucepan filled with water to a boil over high heat. Remove from the heat, add the rice vermicelli, and let soak until tender, 3 to 10 minutes, depending on the thickness of the vermicelli. Drain in a colander, rinse under cold running water, drain again, and pat dry. If desired, grab a pair of scissors and make a few cuts through the noodles to make them less gangly and more manageable. 3. Have ready a large bowl of warm water, a clean dry kitchen towel, a platter, and the rice paper wrappers. Dip a wrapper into the water, turning to dampen both sides, until sorta soft but still sorta firm. The exact timing will depend on the warmth of your water and the brand of rice paper wrappers but could be as little as a matter of seconds. Place the wrapper on a damp towel or cutting board and assemble the first roll by laying a small portion of pea shoots horizontally on the bottom third of the dampened wrapper. Top with a small mound of noodles, spreading them horizontally. Place some salmon, a couple pieces of scallion, and three cilantro sprigs horizontally on top. (You want to use 1/8 of the total amount of each ingredient for each roll.) Roll the edge of the wrapper nearest you over the filling just a little, tucking the filling inside and creating a tight cylinder. Roll it halfway over again and then fold in the sides of the cylinder, envelope style or, if you prefer, burrito style. Continue rolling the wrapper, keeping the filling tightly packed in the cylinder. (It’s important to roll the ingredients into a snug cylinder. If it is not snug, the filling will fall apart when you cut or bite into the roll.) Place the roll, seam-side down, on the platter. 4. Repeat with the remaining rice paper wrappers and filling ingredients. Cover the summer rolls with a damp paper towel and then with plastic wrap and set aside at room temperature for up to 2 hours. 5. Cut each summer roll in half on the diagonal. Arrange on a platter or on individual small plates, making certain that the summer rolls don’t touch or they’ll stick together like crazy glue. Serve with little bowls of the dipping sauce. Rice vermicelli are thin, round, rice flour noodles that commonly appear in the cuisines of Southeast Asia and southern China. They are often used in soups, salads, spring rolls, and stir-fries. You need only pour boiling water over them and let them soak for about 5 minutes before using. Look for them in well-stocked supermarkets or in Asian grocery stores. Rice paper wrappers, sometimes labeled spring roll wrappers or bánh tráng, are thin, translucent, dried sheets made from ground white rice, water, salt, and usually a little tapioca flour. They come in various sizes and shapes and are softened in warm water before using. They are typically rolled around fillings and then served fresh or deep-fried. Look for them in well-stocked supermarkets or in Asian grocery stores. Salmon Summer Rolls Recipe © 2016 Diane Morgan. Photo © 2016 Leigh Beisch. All rights reserved. All recipes and photos used with permission of the publisher.